Taylor Memorial Field is a baseball park in Pine Bluff, AR and was the home field of the Pine Bluff Judges from 1939-1940 and 1950-1955, the Pine Bluff Cardinals from 1948-1949, and the Pine Bluff Locomotives in 1996. The field is also the current home of the Pine Bluff High School Zebras baseball team. Taylor Memorial Field is located at 6th Avenue and Florida Street in Pine Bluff. It was built to replace Missouri Pacific Park and was named in honor of Pinchback Taylor, a Pine Bluff real estate dealer who in 1938 donated the land on which Taylor Field is located. Taylor, vice president of Pine Bluff Judges at the time, was named president of the team in 1940. The construction of Taylor Field began in late December, 1938. On the 22nd of that month, James McGaughy had announced that President Roosevelt had approved the Works Progress Administration to construction the ballpark at a cost of $40,000 dollars, the second most expensive ballpark ever built in Arkansas at the time. When completed, Taylor Field was one of the finest parks in the Cotton States League. It featured a 1,800-seat grandstand complete with boxseats, additional bleachers seating about 500, locker rooms, a concession stand, restrooms and a lighted field. Pine Bluff’s new ballpark officially opened on April 19th, 1939. Only 675 people showed up to watch the game and the Pine Judges lost to the Hot Springs Bathers by a score of 3 to 4. Such was the result many of the games the Judges played in Taylor Field’s inaugural season, finishing 7th in the league with a 57-76 record. The next season went even worse, as the team finished 8th with a 49-83 record, and shortly after the 1940 season, the team folded. 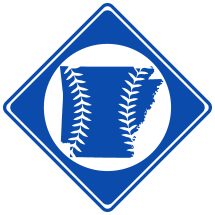 Like many of the minor leagues during the mid 1940s, the Cotton States League ceased to operate from 1942-1946 due to World War II. The league started back up in 1947, and Pine Bluff was emitted in ‘48, meaning Taylor Field was once again hosting professional baseball. The team was called the Cardinals for two seasons before changing their name back to the Judges in 1950. Taylor Field’s second run at professional baseball went much better than the first. In fact, in 1950, the team finished first in the league, though lost in the 1st round of the playoffs. The Judges also made it to the playoffs in ’51 and ’53, but Taylor Field never saw its team win a league championship. The Pine Bluff Judges continued to play at Taylor Field until 1955 when the team moved to Meridian, MS and became the Millers. Immediately following the season, the Cotton States League folded. The ballpark saw nothing but amateur use for the next 40 years before the Pine Bluff Locomotives joined the independent Big South League in 1996. In the team’s only year, the Locomotives went 42-30, losing in the first round of the playoffs. Taylor Field has not since been used professionally, though it remains in good condition. In the early 1990s, Torii Hunter, a Gold Glove All-Star major league outfielder, played on the field with the Pine Bluff High School Zebras. The University of Arkansas at Pine Bluff baseball team also used Taylor Field until the Torii Hunter Baseball Complex in Pine Bluff opened in 2011. Today, Taylor Memorial Field stands as one of Arkansas’ oldest ballparks. The field has changed little since it opened, though new metal bleachers are now located down the right field line. The ballpark was added to the National Register of Historic Places in 2010.